When I was eight years old my mom gave my sister and I a My Child Doll for Christmas. 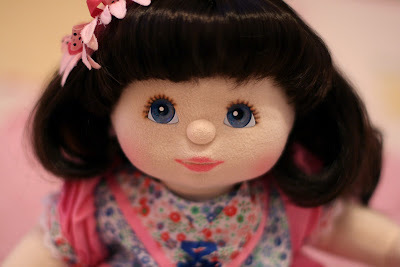 Even though I wasn't huge on baby dolls, I adored this one. 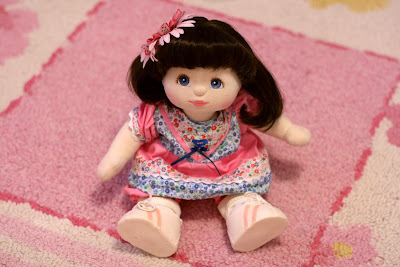 At the time I had a friend named Eric with black hair so I decided to name my doll Erica. When my mom got pregnant with my little sister we went to a class at the hospital that taught us all about babies, how to take care of them and how to change their diapers. We were allowed to take a doll so of course Erica accompanied me. I don't know what ended up happening to Erica. Chances are she went the way of all yard sales. 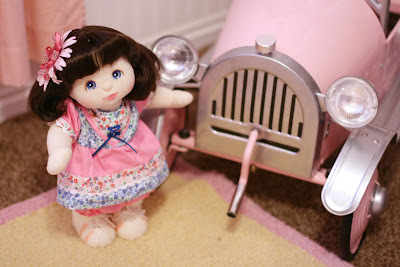 But in 2004ish I found another doll that looked just like her. I put the doll away for a time and recently found her again. She was really gross looking so I decided to restore her. So now I present to you: THE NEW AND IMPROVED ERICA! I am really happy I found the time to restore her. Her hair was horrible. I had to wash it pretty thoroughly and cut some new bangs. Now she's as good as new and sitting on my dresser. In the picture she is wearing Cabbage Patch clothes. I am going to try and find some more during my thrifting adventures. I have found probably four or five actual My Child Dolls over the years, including a Hispanic boy. But I sold them all but Erica. If I find more I will probably keep them. They can go for quite a lot on eBay these days.